You don’t have to keep your car dirty just because there’s a drought on. It’s possible to keep a clean car without using any water at all. 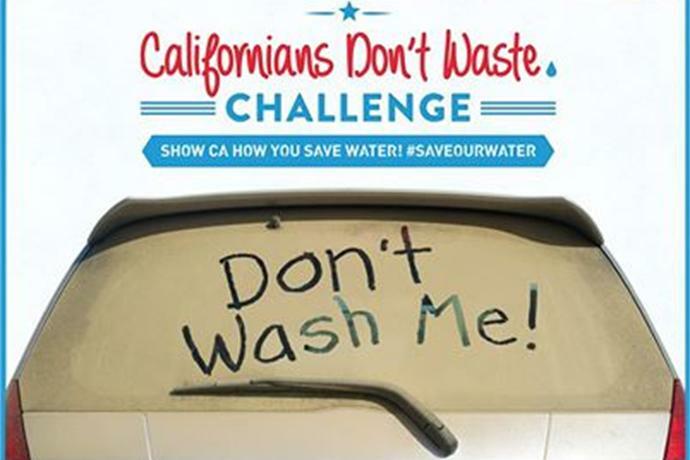 Californians have been encouraged to keep their cars dirty as a gesture of solidarity amid the worst drought in recorded history. It’s an effective way to save some water. But it has been hard to swallow for many residents of the car-crazed Golden State. Washing a car requires around 30 gallons of water at minimum if you use an automatic shut-off nozzle on your hose — and you better be. It can waste more than 100 gallons if you leave an open hose running while you suds up the car. An automatic car wash falls somewhere within that range. But what you may not realize is that it is possible to wash a car without using water at all. It’s not some kind of parlor trick for spendthrifts. Wealthy car collectors have been cleaning their cars this way for decades. In fact, most of the machines we drool over at car shows are kept clean at the show without using water. That’s because frequently washing your car in the traditional soap-and-water way can actually create zillions of tiny paint scratches. The alternative is to use a “waterless” car-cleaning solution available from any auto parts store. You spray it on, then wipe off with soft microfiber towels. Some of these cleaning solutions have wax mixed in, so you can do the whole job in one step. Acquire a lot of microfiber towels, and always wipe your car with a clean surface. That means folding the towel at first, then flip and refold as soon as it gets dirty. Spray on the waterless cleaner generously. You need the surface very wet to “float” away the dirt. Expect a bottle of waterless cleaner to last for only two washes or so. Wipe lightly and only in one direction. Wiping in circles means your going back over clean paint with a dirty towel, which can create scratches. Work over the car in sections, for example one body panel at a time. Use a separate towel for wheels, and consider using a special wheel cleaner. Wheels are covered in very fine brake dust, which you don’t want to spread to your paint. Sadly, if your car is very dirty, you may need to start with a traditional soap and water wash. But after the heavy grime is removed, you can maintain the car with a waterless product. Waterless car cleaning is catching on for a number of reasons. One of them is that the runoff water from washing your car can pollute natural waterways. As a result, a number of high-end commercial car washes have decided to go waterless. Instead of waiting for your car to creep through an elaborate showering and scrubbing system, you wait for a bunch of guys to wipe it down with a waterless product and microfiber towels, just like the ones you can buy yourself at an auto-parts store. Zani’s company is no different. A native of Australia, he obtained distribution rights to a range of high-end waterless car-cleaning products made in the United States. He recently moved to Los Angeles and launched ENVi, a mobile service that Zani developed. You can summon an ENVi crew to your home or workplace to clean your car without water, pollution or waste products while you’re overseeing an important meeting or enjoying a favorite television show. “While our method is our own, it is similar to what car fanatics have been using for years in the sense that they aren’t using a traditional wash,” Zani said. So, if you want to keep your car dirty to show the world you care about saving water, that’s great. But now you know it isn’t necessary. You can keep your car shiny clean and put your water-saving energy into something else, like taking shorter showers or planting native shrubs where your lawn used to be. Drought Pro is an occasional feature exploring advanced or unconventional ways to save water. To submit a suggestion, contact Water Deeply managing editor Matt Weiser at matt@newsdeeply.org.